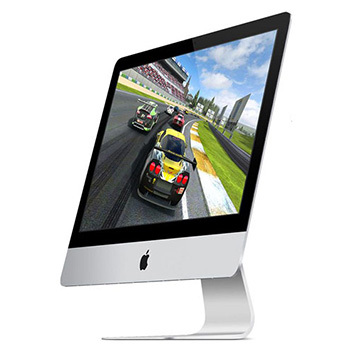 This iMac Core i5 1.6GHz 21.5-Inch (Late 2015) is powered by a 22 nm Haswell Quad Core 1.6 GHz Intel 'Core i5' 5250U processor with a 3MB shared level 3 cache. This model sports dedicated Graphics thanks to it's integrated Intel HD 6000 graphics processor. It's fixed configuration includes 8GB DDR3-1866 (PC3-14900) SDRAM (soldered to system board) and a 5400 RPM 500GB hard drive, a "FaceTime HD" webcam and stereo speakers with no optical drive. This model has a 21.5" 1920x1080 LED 16:9 widescreen IPS display with a monolithic anti-glare glass laminated LCD panel. The sleek aluminum housing of these models tapers to a slim 5mm edge around the screen perimeter with greater girth in the center of the unit. Ports and connectivity come via 4 USB 3.0 ports, 2 Thunderbolt ports, 1 Gigabit Ethernet, 802.11ac and Bluetooth 4.0.